Haihaisoft is core DRM technology provider, Provide comprehensive and professional encryption software system, including: file encryption, video encryption software, audio encryption, PDF encryption, web encryption, DRM encryption protection, digital rights management. DRM-X protects digital media files and documents with a license key to maintain content protection, even if these files are widely distributed. Each license is uniquely assigned to each computer. This prevents illegal distribution of digital media files and documents. DRM-X provides dynamic watermarking capabilities on protected digital content. A watermark is the text includes username and text messages that are superimposed over the media files and PDF documents. In a rights managed content, the watermark can be applied dynamically as the media file is played in Xvast/HUPlayer or the document is opened in Haihaisoft PDF Reader. The watermark is not editable by users and is not permanently stored in the media file. With dynamic watermarking technology, user's piracy behavior is recorded. Content owners could easily discover who distribute piracy, and prevent further piracy. Licenses are issued independently of the actual documents and media files, providing maximum flexibility and allowing wide distribution of content. Each time a file is opened, Xvast browser, HUPlayer or Haihaisoft PDF Reader checks to see if the consumer's computer has a license. Consumers who do not have a valid license are directed to a license registration page. 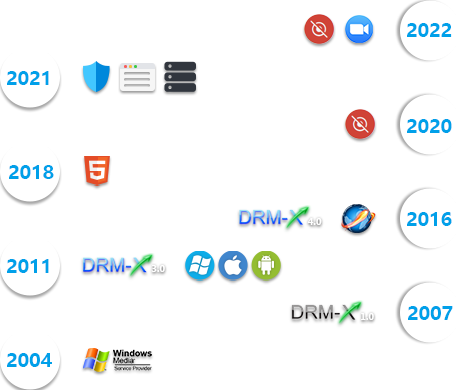 DRM-X identifies each computer or device by Hardware ID. With this feature computers can be identified and disabled during the licensing process. End User Authentication combined with Hardware ID feature restricts the end users can only acquire license in customers own computer or device, and prevent password share. DRM-X Blacklist feature enable content owners control and block screen capturing or screen recording software. Because licenses and protected files are stored separately, licensing terms can be changed on the licensing server without the need to redistribute or repackage the file. Smart Prevent Screen Recording supports Windows, Android and MacOS platform. In MacOS, it is actually Whitelist protection, it only allows common system programs and common used programs running. It helps you against screen recording piracy problem. One of the very important new features in DRM-X 3.0 and DRM-X 4.0 is that it supports protected content playback in multi-platform, including Windows, Mac, Android, iOS(iPhone/iPad). DRM-X 4.0 is a new generation DRM platform based-on web browser. DRM-X 4.0 gives customers higher security level of protection, it's more stable and easier to use. It supports playback online, read PDF online, interact with website, and also support local playback offline. It supports multiple platforms, Windows, Android, iOS and MacOS. Strong encryption both online/offline playback. Advanced DRM-X 4.0 security features, such as dynamic watermark, blacklist, hardware combine, and Smart Prevent Screen Recording Technology. Play high definition video online/offline. User's streaming experience is as fast as Chrome's speed. Better interact with web page. Less streaming cost, auto cache content. Streaming also support CDN networks. Encrypted web content supports Windows, MacOS , Android and Apple iOS. With DRM-X powerful online control panel in DRM-X My Account. You can easily manage rights, license profiles, user accounts, and billing. For more information, please visit. Haihaisoft provides a series of solutions, including DRM-X for Mobile Phones and Portable Devices, CMS (content management system), media batch encoding, media streaming solutions to meet customers' needs. Our solutions are deployed by companies in the entertainment, consumer electronics, gaming, software, information publishing and corporate IT markets to solve industry-specific challenges. Haihaisoft provides a series of solutions, including DRM-X for Mobile Phones and Portable Devices, customization of Xvast browser, HUPlayer and PDF Reader, CMS (content management system), automate batch protect Audio/Video and PDF, media streaming solutions to meet customers' needs. Our solutions are deployed by companies in the training, consumer electronics, software, information publishing and corporate IT markets to solve industry-specific challenges. DRM-X which is developed independently by Haihaisoft, it provides content providers with more opportunities to reach more customers especially smartphone users. It also provides smartphone users with a more convenient way to get licensed content. Meanwhile, it creates more business value for content providers. You can easily integrate DRM-X platform with your own system by consuming Haihaisoft DRM-X XML web service. The Haihaisoft DRM-X XML web service provides the interface that your website can deliver license to customers. For example, when a customer ordered a protected content from your website, when customer plays the content, it will prompt your website customized login page, after customers input Username and Password of your websites account, they will get the license immediately to play the protected file. You could read the Haihaisoft DRM-X XML Web service document online and integrate with your system by your developers: Integrate with your system. It just like invoking standard XML web service and create a new DRM login page. Or you can request Haihaisoft provides the integrating service and customize the DRM login page for you, and meet your business model. Haihaisoft services help ensure your DRM success. We provide constant and reliable services. Our engineers ensure DRM integrates with your system and solving the problem that you meet. We provide online Help Center and keep updating for our customers.